i’ve never gotten around to upgrading my Kenwood TM-V71A with the RC-D710 to give it APRS capabilities partially because of the cost, and probably more because i saw APRS as redundant and a little boring. after all, i have a perfectly good SPOT satellite messenger that works nearly anywhere. then one day i came across the AvMap Geosat 5, a touch-screen GPS unit designed to work with Kenwood radios that features full “bi-directional” APRS support. 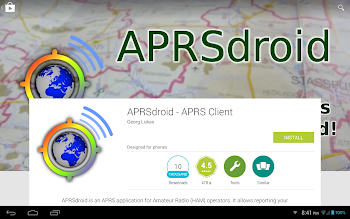 it not only transmits your location via your radio, it also interprets APRS data received by the radio and plots icons for other stations on a map in real-time. imagine you’re out on the trail with some fellow hams, miles from an internet signal, yet you can all see exactly where each other is on an interactive touch screen map. perfect for sending a couple rigs in different directions to scout spur trails and then being able to find each other easily later. now THAT finally got my geek-senses tingling about APRS. the $500 price tag brought me back to earth quickly though. it was also questionable whether any decent/affordable US topo maps could be loaded on the unit at the time (several years ago). i’ve been running an Android tablet in my Jeep for navigation and entertainment now for a while. it’s removable but always goes with me as it’s even replaced my stereo. i had been curious how i could integrate the tablet and ham radio (maybe to achieve AvMap type functionality) but not made it a priority. recently a couple of things spurred me on. 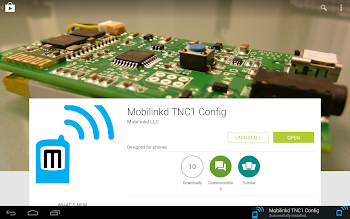 first, i ran across the Mobilinkd bluetooth TNC project and it looked like it could be just the hardware i needed for an affordable price. Second, KE7NEA showed me how he had integrated his Windows based tablet, and the next thing you know everyone on 4x4Ham.com was getting nice APRS setups! so before i turned green, i figured i better get mine going. to play with the APRS cool kids you need (at a minimum) a ham radio, a TNC, and something to put data into the TNC (usually a GPS). a TNC is more or less just a modem. with APRS you hook a GPS to a TNC and that to the radio – much like in the “old days” when you would hook a computer to a modem and that to a phone line (oversimplified, but gets the overall idea across). the more expensive radios have a TNC built-in and some of the newest even have the GPS included. my Kenwood, while a nice little dual bander, has neither a TNC or GPS. the true dual band ability is key though as i’ll be transmitting (and receiving) APRS data on one side while leaving the other open for voice comms. so i’ve got a 2m radio and i’ve got a tablet with built-in GPS, touchscreen, maps, etc. – how do i marry the two? that’s where the Mobilinkd comes in. it’s really just a “dumb” TNC that connects to smartphones/tablets through bluetooth and lets them do all the work. it doesn’t have its own GPS, it can’t digipeat by itself – it might sound limited compared to some of the APRS trackers but it does excel at what it’s designed for – to be inexpensive, small, light-weight and power efficient yet allow both data TX & RX. the little guy is the size of 2 packs of gum including the rechargeable battery and 3d printed case. it claims a run-time of 2 days on a full charge. if you don’t have a Windows, Android or Linux based mobile device with bluetooth, this isn’t for you. but if you do, then you can be quickly up and running with nearly any hand-held or mobile radio just by getting the correct cable and choosing a few settings. i should mention that if you’re just looking to transmit your location to an iGate so that someone back home can see where you are, you don’t need a complex setup. one of the TinyTraks from Byonics or an APRS product from Argent Data Systems and a simple 2m radio would do the trick. i’m not keen on the 3d printed case. it looks junky IMHO (like from a first gen printer or it’s being pushed too fast). originally the TNC was sold for $49.95 and had just a large clear heatshrink over everything. i actually preferred that approach. now they come with the case and a ferrite bead but show as “$64.95 was $69.95“. objectively $65 is not a bad deal at all – i’m sure the seller isn’t making very much considering it’s a niche hobby business with limited production. my issue is that when you set an initial price, that’s what people see the product as worth. a suggestion is to sell a stripped down “hacker version” without the case or battery for the original price – there’s just something to be said for coming in under $50. price-point & case nit-picking aside, i think the Mobilinkd is a nice solution. for under $90 i got a TNC, the correct cable to attach it to my Kenwood radio, the ferrite bead, and basic shipping. it only took a couple of days to arrive via USPS in a padded envelope. the coolest thing about the Mobilinkd is both the hardware and software are open source! the schematic is available on their downloads page and the firmware is on GitHub. You can even re-create most of the functionality yourself with a cheap Arduino. it took longer to read and process the instructions than to actually do it. first i made sure the switch on the TNC was to the right (the end with the connectors) for “Kenwood/TNC style PTT”. i installed the Mobilinkd config app from the Google Play Store, paired the TNC with my tablet over bluetooth, and then plugged it into the back of the radio. the hardest part was getting to the mini-din connector because of where i mounted the radio! i’ll route the cable better – this only was a test run. just be sure you’re trying to plug into the DATA port. i double-checked the Kenwood’s data settings. the data rate was set correctly at 1200 bps (menu 518) and in fact all the defaults were still in place and appropriate for my config. notice the little “D” on the right side of the display indicating that the “B” band will be used by the data port (menu 517). menu items 519 & 520 are also related to data, but i left them alone and everything worked. the only configuration change i needed to make to the Mobilinkd was to enable the PTT option. i did try the test tones on a free simplex channel with my little Baofeng as a receiver just to make sure everything was coming through clear. i used 145.500 MHz because the AZ VHF Band Plan lists it for “packet simplex & experimental modes” and it was clear at the time. once you’re sure everything is good, tune to 144.390 MHz (in the US). next i installed APRSdroid from the Play Store. you can get it for free (here) if you are comfortable installing the APK manually. i went ahead and purchased it to support the developer, please consider doing the same. besides beaconing your position (obtained from the Android device’s internal GPS), the app’s notable functionality is to plot your and other nearby stations on an interactive map. it has a few other features such as allowing operators to send and receive text messages between one another. you’ll need to enter your call sign and an APRS-IS passcode to get started (Google if you are impatient like me). i set my SSID to the customary 9 for a mobile station, and my APRS symbol to /j for my Jeep. leave the location source on SmartBeaconing™ unless you have a good reason to change it. 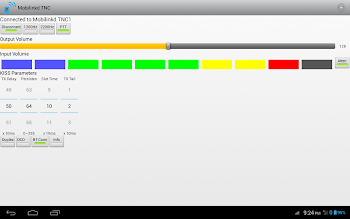 APRSdroid can interface with a radio through several methods, the one applicable here is the KISS protocol via bluetooth TNC. so be sure to set the connection to “Bluetooth TNC” and choose the Mobilinkd. otherwise you’ll be using APRS-IS by default and not actually doing any RF communication. i pressed the “Start Tracking” button and within a few seconds began seeing other stations on the map as well my own, so i went driving! you can see the little trail i left in the above photo. all in all, it took longer to type this post than to successfully configure and test the whole setup. since i already had the tablet and the radio, only a minimal investment of money and time was required to join the APRS players club. not everyone has a fully integrated tablet setup in their rig already, but most folks do have a smartphone. you might even have an old one laying in drawer that you could dedicate to this. so grab it, a quality phone mount, a Mobilinkd, your radio of choice, and enjoy! test the setup with some fellow hams out in the desert! I did not realize that you could make the Kenwood TM-V71A run APRS and voice simultaneously. Right now I’ve got a Kenwood TM-281 dedicated to APRS exclusively and I’m running a completely separate radio for voice. I’ll have to look into the TM-V71A. cool, i checked out your site – what state are you in? i’m still deciding whether i want to dedicate my little Baofeng radio to APRS and keep both sides of the Kenwood for voice. i liked running simplex on one side and a repeater on the other at times. however, if i did the Baofeng then i’d want to install another external antenna or get some sort of duplexer for the existing one i guess. plus the Baofeng power is miniscule compared to the Kenwood (for trying to hit a repeater with APRS beacons when in the middle of nowhere). Sorry, I just now noticed your question after I was re-looking up the page to share the link with a friend. I’m in Tennessee just south of Nashville. After having run APRS on a dedicated handheld in the car for a couple years, I’d recommend keeping APRS on the Kenwood and let the weaker handheld monitor 1-2 voice channels. There are two issues with the Baofengs for APRS. One, they don’t always cut squelch fast enough to decode the front end of a packet. Two, depending on the area, 3-4 watts for APRS can leave something to be desired. I’d recommend using the mounted Baofeng to monitor 1-2 voice frequencies and then if you hear chatter on them, turn your Kenwood’s free side to that freq and respond. That will let you monitor more voice frequencies without sacrificing the quality of your APRS reception or transmissions. great real world info – thanks! Thank you for your demo here. Can you tell me if you ordered the cable for connecting the tnc to the radio from mobilinkd? They have a 6 pin mini din cble pre made but I do not know if it is designed to work with the kenwood or the yaesu. I compared the two schematics and it appears that there are 2 wires that are reversed between the two data ports on the yaesu and kwood. The packet in and packet out seem to be on different pin locations on the plug so I do not think it will work on both type radios. I need to have one just like you have for the kenwood and wonder if yu can direct me on where to get one. Thank you. How do you enable ptt mode? I’ve successfully configured this TNC with my Baofeng, and I’ve attempted to do so with a TMV71 and a TMD710. Aside from setting the VFO side and baud rate, what else do you have to do to enable PTT mode? That’s the only area that I’m a little fuzzy on. you don’t have to do anything special on the Kenwood, it expects PTT already. on the mobilinkd, make sure the switch on it is to the right (the end with the connectors). then use one of the configuration utils to set the PTT feature in the firmware to ON (just check the box) – the Windows config tool is here: http://www.mobilinkd.com/downloads/, the Android one is in the Play Store. Thanks for the write up! I have always had concerns about multiple radios in the car. I’m worried the close proximity of transmitter will blow or deafen the front end of the other. Even the 1-2 watt uv3r can damage the front end of that Kenwood like an air horn in it’s ears. I wouldn’t mind blowing the front end out of the baofeng though, it was a cheap thrill to begin with. Are you able to use the messaging function on AprsDroid….in effect sending data from the tablet out onto RF? unfortunately i don’t actually run with many folks that even have APRS, so i’ve never been able to really test out seeing each other on a map while out on a trail run – much less the messaging feature. I have the Kenwood TM-D700 and I’m wondering how you set the menus. I’m wondering if I will still have a dual band rig while using the mobilinkd. i’ll have to check the radio again to get the menu settings – it’s been a while since i did this. you would not still have voice use of 2 channels simultaneously any more as you have to dedicate one side entirely to data use for APRS. however, you can still use either of the bands (2m or 70cm) on free side. Great articles about using aprsDroid. I plan to use this setup only question I have is with offline maps. I can not seem to find the article that discuss that subject. Amy idea where I could find.